I went to this art fair in Irvington at the Benton house a while ago with my friend Jess and while we were there, we went into the conservatory. I love plants. They were selling all sorts of interesting little plants, and while I was looking at all of them, I came across this domed glass container. It was dirty and rust stained, but I knew it would make an awesome terrarium. I’m not sure what exactly it’s original purpose was. So, I picked it up and bought some plants – all succulents. 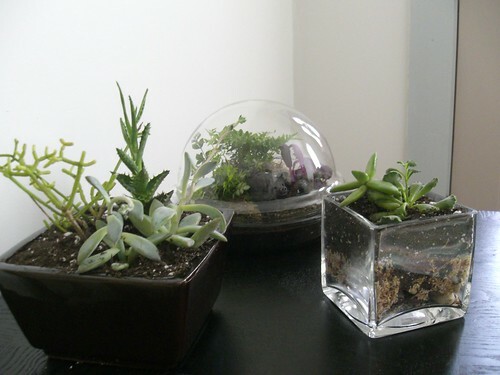 When I went on the internet I found out you can’t keep succulents in a closed terrarium because it is too humid for them. Oops! 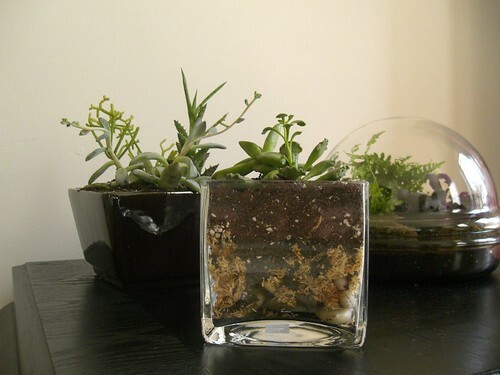 So then I scavenged some containers I had around the house and made two desert terrariums, and got some new plants to go under the dome, I went with a more ferny, mossy, woodsy style in that container. I love how they turned out. I added a little ceramic good luck pig from Chile that I got a while ago to my domed terrarium. Here’s a better picture with the dome off, since there was a lot of glare on the glass. 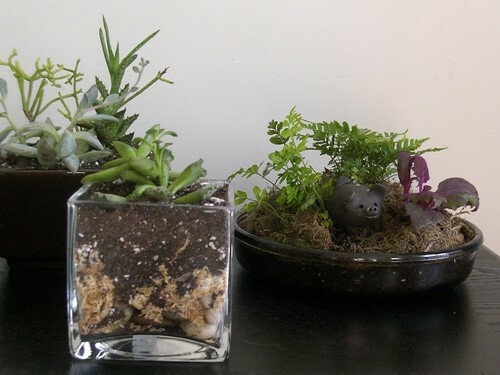 When I have time, I would like to go looking for some more cool glass containers and make some more. I will have to start giving them away, because I don’t have enough flat surfaces to display them all. I like how domed terrariums have an old fashioned-ness about them, and I like seeing the strata of organic materials in the clear glass. You can pretty much make them in anything – jars, glass ornaments – and there is lots of inspiration on the internet. I went a little crazy this year with the holiday baking. I just really love making cute stuff. Edible cute stuff – even better! 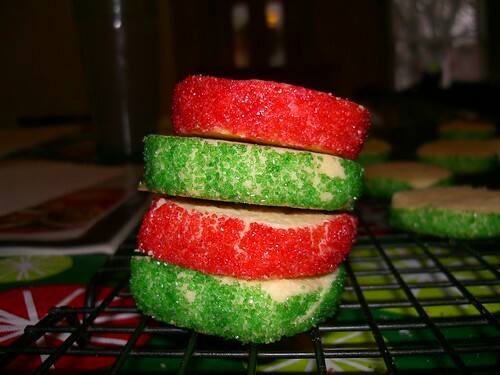 I don’t have a sweet tooth, but cookies and candy are about the most fun thing to make. 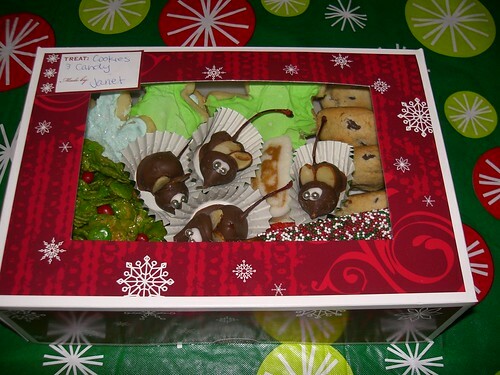 I made so much stuff, I mailed boxes of treats to a few friends, and gave boxes to ones locally. I still had a ton left over to bring home for Christmas. My cousins’ kids were happy – no one else made cookies this year! Some of the cute things I made this year. Unfortunately, it is not easy for my to photograph what I am making when my hands were constantly covered in sugar and flour, so not everything got it’s picture taken. That box has quite a few though. 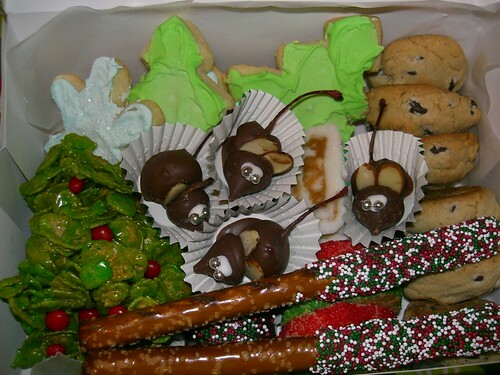 There’s chocolate cherry mice, chocolate covered pretzels, sugar cookies (tree and snowflake), cornflake wreaths, plain ol’ chocolate chip cookies, and potato candy. Yes, potato candy! It’s very rich and sweet. My dad was talking about how his grandma used to make it every year when he was a kid. I made a mental note to try making it, and I surprised him when I came home for Christmas. It’s easy – 3 ingredients – a potato, 2lbs of powdered sugar, and peanut butter (creamy). Boil and mash a small potato (trust me, a 1/2 c. of potato makes a ton of this candy). 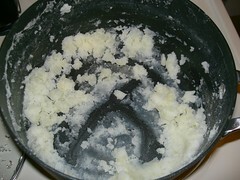 Now take the HOT mashed potato and put it in a mixing bowl. Add sugar a little at a time. I don’t know why but when you first add the sugar, it liquefies to potato and you get this strange colored, glue – like mess. Don’t worry – just keep adding sugar and stirring. 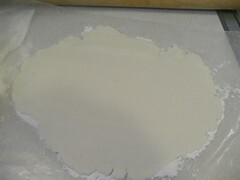 You will get a ball of white “dough” that is play-doh consistancy. Split it in half and put one half between two sheets of wax paper to roll out. You need to work fast. You have to get this done before the dough gets too hard to roll. Roll out to about a 1/4″ thickness. Looking back, you should probably make it shaped like a rectangle, but I wasn’t thinking about that at the time because it was the first time I did this, and really didn’t know what I was doing. 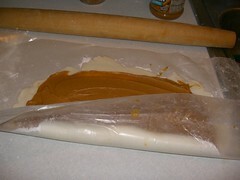 Now, spread your candy with a thin layer of PB. 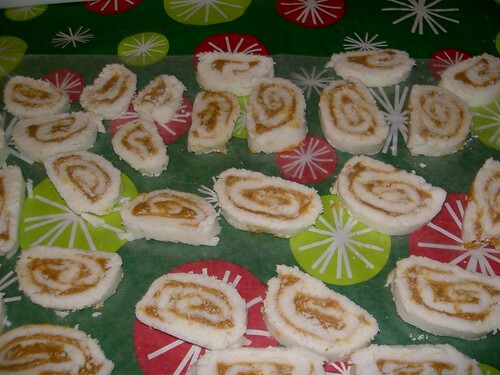 If there is too much PB, then it all squishes out the ends when you roll it. Take the bottom piece of wax paper, and use it to help you roll it up. Its kindof like doing sushi, if you’ve ever made that. Take your log and wrap it in plastic wrap and put it in the refrigerator for it to firm up. Repeat with the other ball of dough. Then you can cut it into slices and enjoy! I also made some cornflake wreaths. 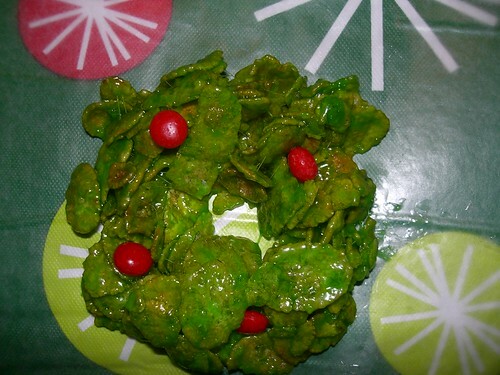 During that same conversation with my dad, my brother said his favorite Christmas cookie was a cornflake wreath. After my inital “seriously?! WTF” reaction, I decided to surprise him as well. It’s basically a rice krispy treat with cornflakes instead of krispies and lots of green food coloring. This is another beat the clock recipe, because you have to get them all made, shaped and the candy “berries” stuck on before it cools and they wont stick anymore. I think help from a friend would make this a lot easier. I also made some old fashioned sugar cookies. I think they tasted better than the frosted ones. I also made some marshmallows and dipped them in chocolate. I dont have any pictures with them dipped. 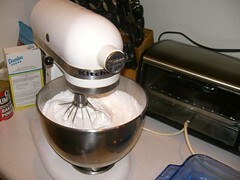 Marshmallows are really easy to make if you have a kitchenaid mixer. Once you get everything together, you have to beat it on the highest speed for 10 minutes. Pour it in a greased glass pan, let it sit overnight, and the next day turn it out and slice. I used a pizza cutter, it worked really well. 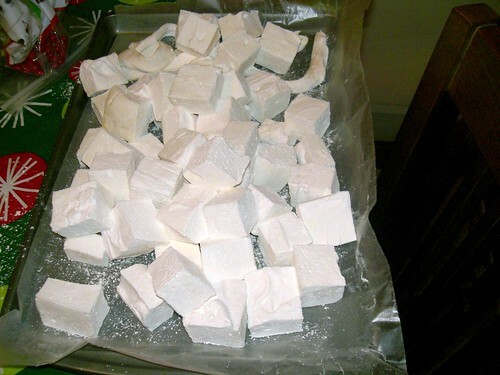 one 9×13″ pan makes about 50 1.5″ square marshmallows. 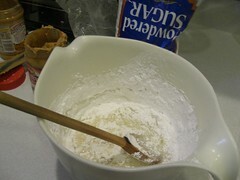 roll them in powdered sugar so they wont be sticky. Quick side rant: I went to the Indy Winter Farmer’s market last week and they had a new vendor there selling nothing but marshmallows. Apparently they got a best of Indy award from Indianapolis Monthly magazine for best artisan marshmallows. They were giving free samples so I tried one. Mine were WAY better. WAYYYYY better. Granted theirs were flavored, and I just made vanilla, but flavoring cant change the marshmallows that much! They were just really dry and chewy and looked really ugly. They were all lumpy and uneven and ugly dull colors. Mine are relatively square, bouncy, light and fluffy. Anyway, I couldn’t believe these people were charging 3 dollars for 4 of their crappy marshmallows. And people were buying them! I called my mom and ranted to her (like I am now)…she said I should start selling my candy. Coming from my mom, who can find something wrong with anything, that is a huge compliment about my candymaking skills. That gave me a lot of confidence I can do this. Next year. I swear. I will be at that Winter Farmer’s Market, and I will be selling my marshmallows! And other candy. I am really into this idea. I like sewing, but not for profit. I tried and wasn’t that successful, because the time and expense of making sewn goods rarely makes it profitable to sell. Non-crafty people don’t realize the amount of time and skill and money it takes to make really nice baby quilts or cute bibs from imported japanese fabric or designer fabric from someone like Heather Ross. With candy, it’s relatively cheap to make, even if you are using all organic ingredients, and you can make a large amount in a comparatively short amount of time. And people don’t think about spending a couple bucks impulsively, whereas they are going to think long and hard about spending 75 or 100 bucks on a handmade quilt. I think I can do this and be successful. And I have like 8 months until the next season of the winter farmer’s market to practice and plan. I am really excited about this right now. You may be seeing a lot more candy making in my blog in the near future. I should have blogged about all this Christmas baking when it was actually Christmastime, but maybe it will inspire someone to try something new next year. And I like posting pictures! I FINALLY finished my poor bee member’s blocks for November. I am ashamed! They were sent out the Monday before Christmas. I am happy with them, it was my first time paper piecing. I liked the technique, I will have to try it again. I still need to finish my Dec. blocks. I have one done, but I am only halfway done with the other one. Then January! I will finally catch up this month. I need to start thinking about what I want to send out…my month is coming up in March. 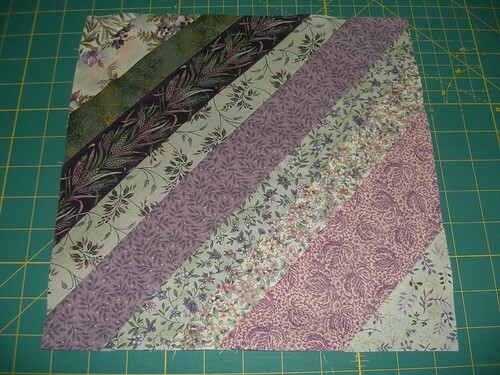 I am really looking forward to seeing everyone else’s blocks with my fabric. 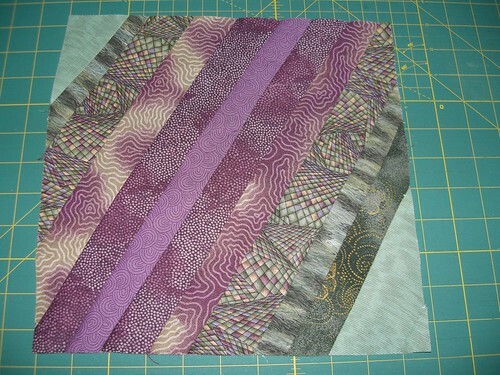 I also made a reversable quilted tote bag for my mom for Christmas, but I forgot to take any pictures of it. It turned out pretty well, considering I didn’t have instructions on how to finish what we started in the class I took! So Happy New Year everyone, I hope you had a nice holiday season. Let’s see if I can keep that blog writing resolution!